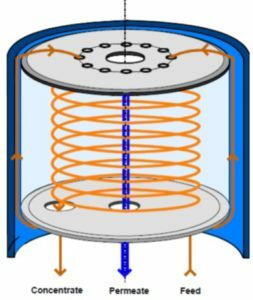 What are Circular Disc Membranes & Modules? 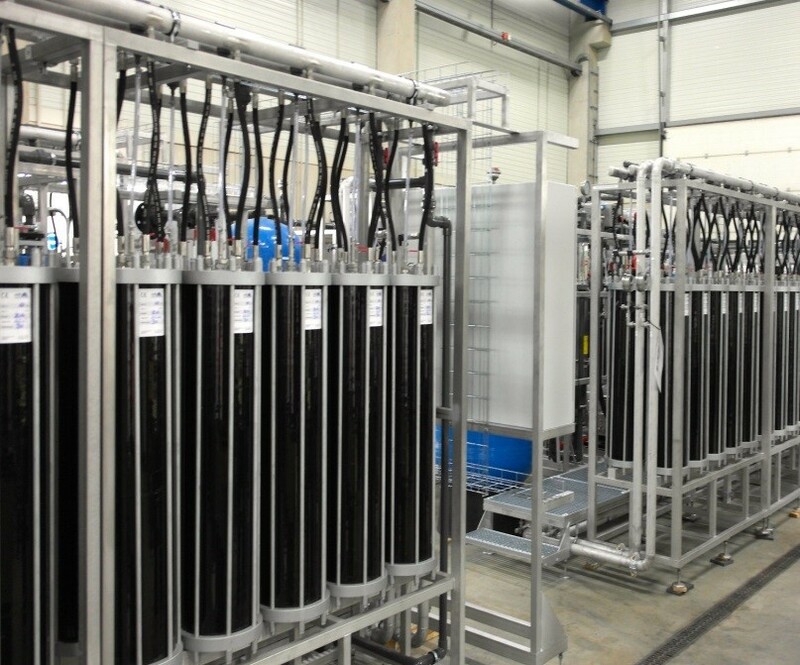 CD Membranes are unique and highly efficient ultrafiltration-based systems used to concentrate water and waste water streams to a very high degree. 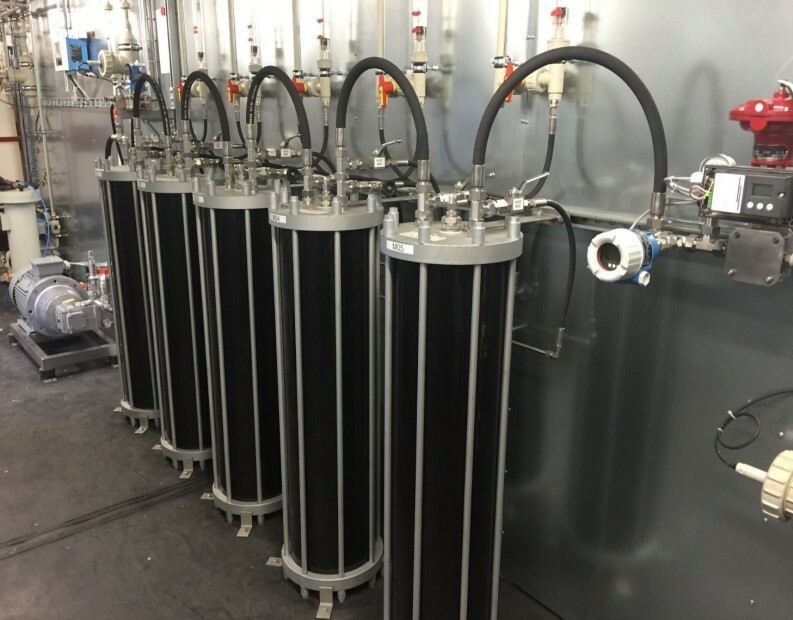 Concentration of heavily polluted water and waste water to a very high degree, using pressures up to 140 bar! Recirculation / re-use of most of the incoming volume; the recirculated water quality is very high. Reducing the volume of residual waste water to a very low level, dramatically reducing the quantity for later disposal. 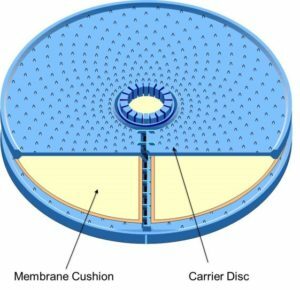 Circular membrane cushions are mounted on each side of a carrier disc. Carrier discs & membrane cushions are “stacked” inside a pressure cylinder, forming a CD Module. Water or wastewater flows across both sides of each membrane cushion. Water flows on each membrane in a circular manner, helping to keep the membrane clean. Each of these vessels has a total membrane area of 9m2 and so each of these is a CD-9 module, each of which has the characteristics shown in the table below. The picture below shows five CD-9 units installed in series. Pressure drop across each CD-9 module is slightly under 2 bar. This means that the total pressure loss across the 5 modules shown in the picture is 10 bar at most. This is FAR lower than competitive membrane systems. This means that, typically, operating costs for pumping 1m3 of liquid through the modules is typically 5 – 8 kWh less than its competitors. So, if we assume a flow rate of 5m3/h for 8,000 hours per year, at the lower saving of 5kWh/m3, the reduction in electricity consumption per year would be 200,000kW per year. If we assume an electricity cost of £0.1 per kWh, this represents a saving of £20,000 per year! 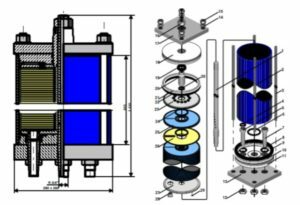 Not only that, but since CD Modules can operate at pressures up to 140 bar, the concentration achieved is FAR higher than with conventional systems. If we assume that for your application we can concentrate the 5m3/h feed down to 0.5m3/h (90% reduction), the 95% permeate, being pure water, can then be re-used. If we assume that mains water cost (including drainage charge) is £3 per m3, over 8,000 hours, this equates to a saving of £108,000!! In addition, if you need to have a ZLD system, the cost for the final evaporation system, both CAPEX and OPEX, will be far lower as a result because you need to evaporate far less water than if using a conventional membrane system.